Kulan Gath's Tournament of Death pits Red Sonja against John Carter of Mars as the Pathfinder heroes struggle to wrest the Scepter from Empress Camilla and her inter-dimensional alliance of vile villains! As secret armies boil from the arena's understructure, the heroes learn that immortal villains live forever for a reason, while heroes die all too easily. Co-starring John Carter, Red Sonja, Tars Tarkas, and more! 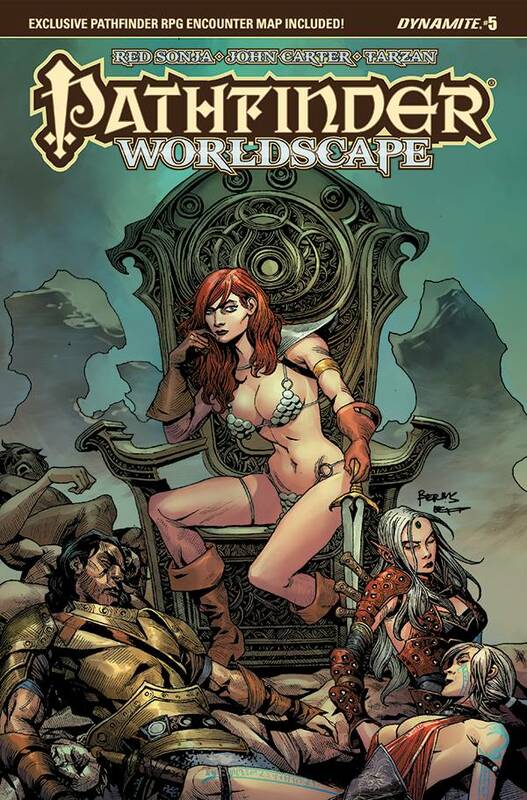 Written by Pathfinder publisher Erik Mona (Pathfinder: Hollow Mountain) with art from Jonathan Lau (Red Sonja and Cub). Contains a Pathfinder RPG rules appendix and a bonus pull-out poster map!